Liverpool beat nine-man Newcastle to finish the season on a high note, but their hopes of a first league title in 24 years were dashed as Manchester City beat West Ham to be crowned champions. The Reds started the day trailing City by two points with a far inferior goal difference, meaning they needed to beat Newcastle and hope City lost at home to the Hammers. Liverpool did their job as Daniel Agger and Daniel Sturridge converted Steven Gerrard free-kicks to cancel out Martin Skrtel's first-half own-goal. But the result at Etihad Stadium rendered that irrelevant and Brendan Rodgers's team were forced to settle for second place. They can, however, comfort themselves with the knowledge they defied expectations by even challenging for the title, and passed 100 league goals for only the second time in their history. And with Champions League football returning for the first time since 2009-10, there is renewed belief the good times could be coming back to Anfield. It a position Newcastle can only dream of; they squandered a first-half advantage to finish 10th, with Shola Ameobi and Paul Dummett sent off, and fans calling for manager Alan Pardew to depart. Liverpool's fans arrived more in hope than expectation, once again lining Anfield Road to greet the team bus and belting out an ear-splitting rendition of You'll Never Walk Alone before kick-off. But the Reds appeared nervous from the outset - careless in possession and weak in the challenge - and Newcastle took advantage. Ameobi, out of contract in the summer after 13 years at St James's Park, signalled the threat with an early header. Liverpool probed through Jordan Henderson, back from a three-game ban that many feel derailed his side's title charge, before a quickly-taken free-kick by Luis Suarez was disallowed. Moments later, Yoan Gouffran broke clear on the left and delivered a cross that Skrtel sliced past Simon Mignolet - to the disbelief of most inside the ground but the delight of Newcastle supporters, who had been voicing their disapproval for Pardew. Gouffran twice came close to doubling the visitors' lead as Liverpool produced one of their worst halves of football all season. When they finally mustered some momentum, the out-of-sorts Suarez shot tamely at Tim Krul and Sturridge headed off target from a superb position. News of City's opening goal against West Ham barely registered with the Liverpool fans - their own team's performance was of greater concern - and their afternoon suffered another setback when left-back Jon Flanagan was forced off at half-time. City's second at Etihad Stadium seemed to coincide with a dropping of heads, but Rodgers sent Philippe Coutinho on in place of Joe Allen, and his side scored twice in the space of as many minutes. Gerrard was the provider from almost identical positions, his first free-kick met with a back-post volley by a recalled Agger and the second poked in by Sturridge. The atmosphere was transformed, the name of Rodgers ringing out as he applauded all four sides of the ground, and Liverpool's path to victory was eased by two yellow cards in quick succession for Ameobi and a straight red for substitute Dummett following a rash challenge on Suarez. "I thought we were terrific, it was a hell of a performance in the first half but we had a couple of dodgy decisions that were unhelpful. I'm not particularly pleased with referee's explanation for sending off Shola. "We've got to give our fans a lift in the summer by recruiting well. We need to recruit offensive players that are good enough for Newcastle and that is what we will focus on. "Our fans are brilliant fans - they are just frustrated. For the first half of the season we were very good, but in the second half we were not as strong as we should have been. We made errors, myself included." Match ends, Liverpool 2, Newcastle United 1. 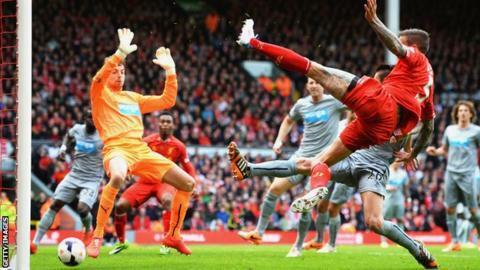 Second Half ends, Liverpool 2, Newcastle United 1. Corner, Newcastle United. Conceded by Aly Cissokho. Luuk de Jong (Newcastle United) wins a free kick in the defensive half. Paul Dummett (Newcastle United) is shown the red card. Luis Suarez (Liverpool) wins a free kick on the right wing. Attempt blocked. Massadio Haidara (Newcastle United) left footed shot from outside the box is blocked. Assisted by Vurnon Anita. Offside, Liverpool. Luis Suarez tries a through ball, but Raheem Sterling is caught offside. Attempt blocked. Lucas Leiva (Liverpool) right footed shot from outside the box is blocked. Assisted by Raheem Sterling. Substitution, Newcastle United. Paul Dummett replaces Cheick Tioté because of an injury. Substitution, Liverpool. Lucas Leiva replaces Daniel Sturridge. Attempt missed. Daniel Agger (Liverpool) header from very close range misses to the left. Assisted by Steven Gerrard with a cross following a set piece situation. Substitution, Newcastle United. Sammy Ameobi replaces Yoan Gouffran. Substitution, Newcastle United. Luuk de Jong replaces Steven Taylor. Fabricio Coloccini (Newcastle United) wins a free kick on the left wing. Offside, Liverpool. Steven Gerrard tries a through ball, but Aly Cissokho is caught offside. Second yellow card to Shola Ameobi (Newcastle United). Shola Ameobi (Newcastle United) is shown the yellow card. Goal! Liverpool 2, Newcastle United 1. Daniel Sturridge (Liverpool) left footed shot from the left side of the six yard box to the centre of the goal. Assisted by Steven Gerrard with a cross following a set piece situation. Yoan Gouffran (Newcastle United) is shown the yellow card. Goal! Liverpool 1, Newcastle United 1. Daniel Agger (Liverpool) left footed shot from the left side of the six yard box to the high centre of the goal. Assisted by Steven Gerrard with a cross following a set piece situation. Vurnon Anita (Newcastle United) is shown the yellow card for a bad foul.